Kate Pepper, a senior at McKinney ISD outside of Dallas, TX, is now allowed to wear her blue wig to school as she battles brain cancer for the second time. The post Texas high school reverses decision after backlash and allows teen battling brain cancer to wear blue wig appeared first on theGrio. 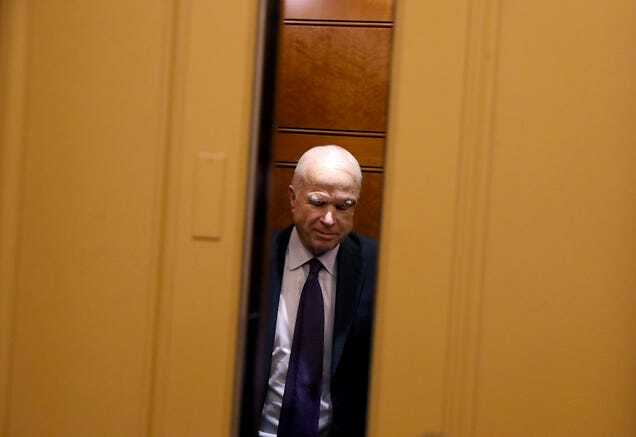 It has been a long and valiant fight but on Friday, Arizona Sen. John McCain’s family announced that one of the most popular Republicans to speak out against the current president’s authoritarian regime will discontinue his brain cancer treatment. The post CDC: Poverty, race factor into higher cancer death risk for black and Latino children appeared first on theGrio. The post Nene Leaks reveals that husband has cancer appeared first on theGrio. The post To all Black families: Remember to speak up about any health concerns today appeared first on theGrio. Reggie “Combat Jack” Ossé has never missed an episode of podcasting in the seven years since he switched from being a hip-hop attorney to a podcaster. The post ‘Combat Jack’ reveals battle with colon cancer appeared first on theGrio. KeKe Wyatt revealed this weekend that one of her children is battling cancer. The post Keke Wyatt shaves head in honor of child’s battle with cancer appeared first on theGrio. Eduvigis Rodriguez had her left breast removed and had to deal with the complications after the surgery, only to find out that she never had breast cancer. The post Woman sues over mastectomy after doctors falsely diagnosed her with cancer appeared first on theGrio. The post ‘Shark Tank’ star reveals he was diagnosed with cancer appeared first on theGrio. Last year, Daisy Lewellyn passed away, and with a year passing, Melyssa Ford is marking the anniversary of her Blood Sweat & Heels co-star's death. The post Melyssa Ford pays tribute to late co-star Daisy Lewellyn appeared first on theGrio. The post Cancer survivor featured in Beyonce’s ‘Lemonade’ accused of fraud appeared first on theGrio. Ebony Banks, the teenage cancer patient who recently met her idol, Beyoncé, over Facebook last week, has died. The post Ebony Banks, teen who Facetime’d Beyoncé from hospital bed, dies appeared first on theGrio. Ebony Banks, a Texas high school student, is battling a rare stage four cancer, but on Wednesday, she got to meet none other than Beyoncé. The post Beyoncé Facetimes cancer patient in surprise of a lifetime appeared first on theGrio. Lethebo Rabalago, a South African pastor, is a self-proclaimed prophet, and he claims that he can cure people of cancer and HIV. The post African pastor claims he can cure cancer, HIV with ‘Doom’ spray appeared first on theGrio. After a year-long battle with ovarian cancer, Ceclia Hart, the wife of James Earl Jones, died on Sunday at age 68. The post Cecilia Hart, actress and wife of James Earl Jones, dies at 68 appeared first on theGrio. Brooklyn District Attorney Kenneth Thompson died on Sunday after a battle with cancer, just days after he announced that he would be undergoing treatment. The post Brooklyn District Attorney Kenneth Thompson is dead at 50 appeared first on theGrio.